There's a mistake that even the experts make when sailing in a breeze, and it has to do with sailing downwind when it's windy. It's something that both Frank and Julian Bethwaite explained to me about sailing 18 foot skiffs on Sydney Harbor. 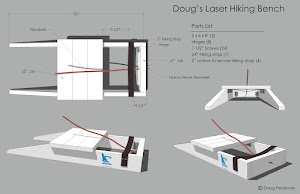 You see, there is far too much power in the sail to control with crew weight alone. They explained how it's done by trying to balance a pencil on your finger, taking all the variables into account as shown in this video. "Some years ago I coached several mature and experienced sailors on the 59er, and I was astonished to find that so many of them were unaware of the steer-for-balance principle. More accurately, most thought they knew what it meant--and that they would be able to use it naturally, if and when it became necessary. But when faced with real speed and a sudden gust they turned the boat the wrong way and simply "lost it." 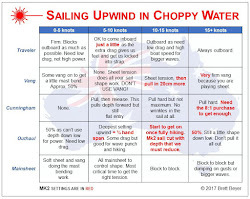 Only a handful of experienced sailors know how to control a sailboat at speed and get peak performance while doing so. Most top sailors believe they know what steer-for-balance is, and they believe they can do it. But when put to the test, they don't know and they cannot do it." Bearing off in pressure does more than get the hull under the rig. It puts pressure on the windward side of the centerboard to push the rig to windward and, of course, going more downwind stretches the puff. 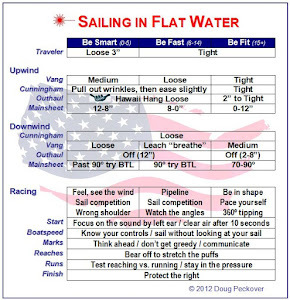 Foiling will definitely teach you better boat handling downwind. Imagine how having such an intro to the speed and foiling experience at a young age would have affected your sailing. What an opportunity for these kids. Ryan now has a set of these foils for his kids to use for training which might just give them an edge on their competition. I love the commentary when Peter, a Great Grand Master, jumps into the boat and effortlessly shows the young-ins how it's done. These same kids all call me "sir" when I compete against them on the water and now I know why.